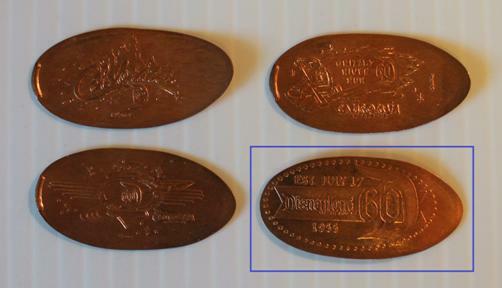 There are 3 sets of 60th anniversary coins: Set 1 has 30 pennies and is available throughout the celebration. Set 2 has 6 quarters, and is also available throughout the celebration. 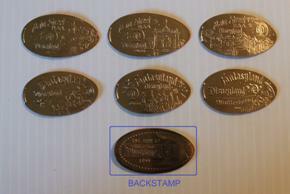 Set #3 has the “decades” coins; these designs switch every 60 days. All are pressed on uncirculated copper pennies and uncirculated ”America the Beautiful” quarters. 60th Critter Country Splash Mt. Complete sets will not be available until after the Celebration ends. Unlike some eBay sellers, my price will not be $500 per 3-coin set. This machine appeared in early 2015, and then disappeared for most of the year. It reappeared in November but two dies had small changes. All of these roll short – the “Disney” at the bottom is generally missing. This is the set with the revised dies from November. This set was retired in January 2016.